Created from the original watercolor batik, Last Light on the Lake, by Listening Point Residency artist Kim Gordon. The four windows of this handmade paper luminary show a view of Listening Point and the lake in the evening light. 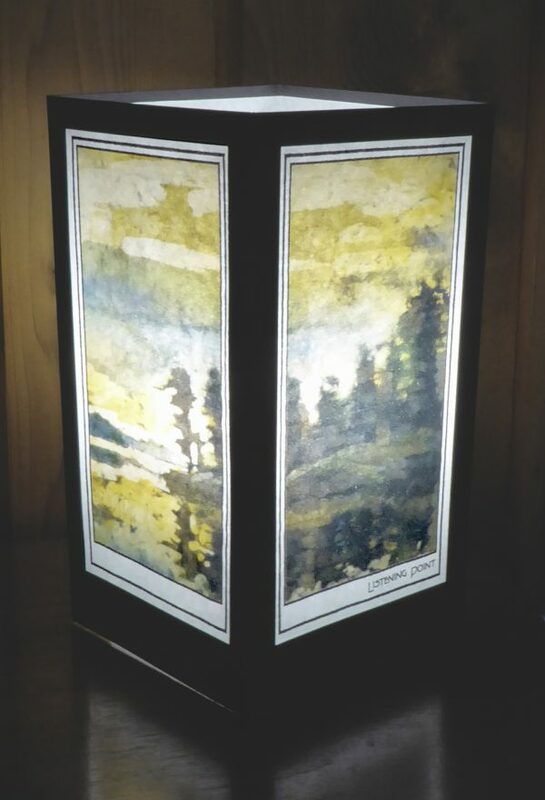 Luminary is 4-sided, measures 5″x5″x9.5″. The windows are printed on archival Japanese washi paper and the frame is of a heavyweight, dense black Forest Stewardship Council cover stock. Place luminary over a flameless candle or tealight (not included) – do not use with real flame! Comes completely assembled in a flat plastic sleeve with simple instructions to refold along score lines to its 3-D shape. Can be re-flattened and stored in its sleeve. Protect from wind and water.